If you have a managed Native & Search account, you can take advantage of using search on native to drive more traffic and maximize the impact of your search campaigns on Oath’s native supply. 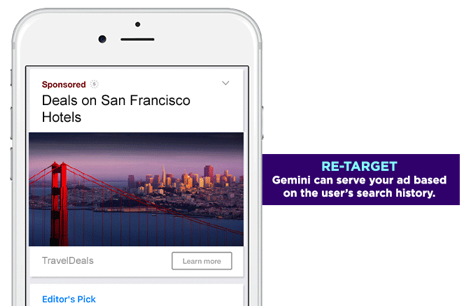 By targeting customers who have searched for your products on native inventory, you can easily extend the reach of your campaigns. If you’re a self-serve advertiser, you’ll need to upgrade to a managed account, work with your account representative and get activated. Some of the best practices for working with Search-On-Native campaigns are described in the sections below. Ads with images drive 16% higher CTR than text ads. Confirm your current image is relevant to all campaigns. Make sure your messages match your images for top performance-driving queries. Maximize fixation and recall by including compelling, people-based images whenever possible. Reinforce brand recall and inspire action by letting your logo shine in images (up to 20% of the total image) and using brand mentions where applicable. Separate your campaigns into similar performing groups (for example, seasonality, purchase-funnel location, price point, etc) to better measure performance across groups with similar goals. Use higher bid modifiers to get more traffic and consider whether other modifiers may be driving down your bid. For example, you’re likely limiting your traffic if you have a search on native modifier in addition to a device type modifier. Run reports in the Native & Search dashboard to gain insights into Search-On-Native performance. Start by running a campaign performance report in the Native & Search UI and use the source column to view Search on Native performance. For example: 1 = search on native and 2 = search. Compare the post-click CPA between search and native supply. 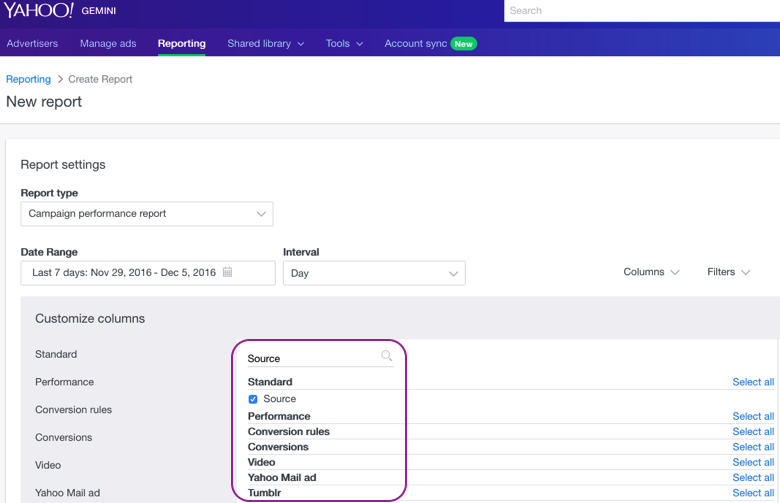 Now run a Keyword performance report using the source column to review and pivot CPA across your portfolio (i.e., to compare brand terms vs non-brand). For keyword performance reports, include a filter for search and native sources. Just like your search campaigns, you can use keyword performance reports to defend positive ROI and add negative keywords where applicable. Swap creative regularly to see what resonates. We recommend refreshing images weekly. Run a Custom - Search Term Report to identify poor performing queries applicable to both search and search on native and negative match within the appropriate campaigns. Add unique creatives at the Ad Group level to drive relevance and specificity across Search on Native. People-based images deliver fixation on PC and deep engagement & lower-funnel metrics on mobile. Let your logo shine. Larger logos deliver recall, action, and longer fixation for your ad on multiple platforms. Brand mentions important to include in the headline of your native ad, especially with static image ads. Users tend to fixate on the “more” button, indicating an interest in clicking, leverage and test the call to action button options available. Refresh and test copy regularly to stay competitive. Test non-branded keywords in three buckets - head, torso, tail. Place keyword portfolios in separate Ad Groups for effective campaign management and optimization. Leverage campaign structure to allocate budgets by campaign priority. Brand and competitor keywords will provide the most volume. Unbranded keywords can provide improved efficiency in SRN, even better than brand and should be tested. Opt in to all match types: Exact, Phrase, Broad, Broad Match Modifier. Use Broad and Phrase to discover new relevant queries and Negatives to optimize performance. Use a tiered bidding strategy by match type initially, then optimize based on performance. Check out this how-to topic for more information: Use Search on Native to Drive More Traffic & Extend Reach.